Over the past years, I have been a fan of QNAP products. From the excellent customer service to the total value of their products, they are hard to beat. 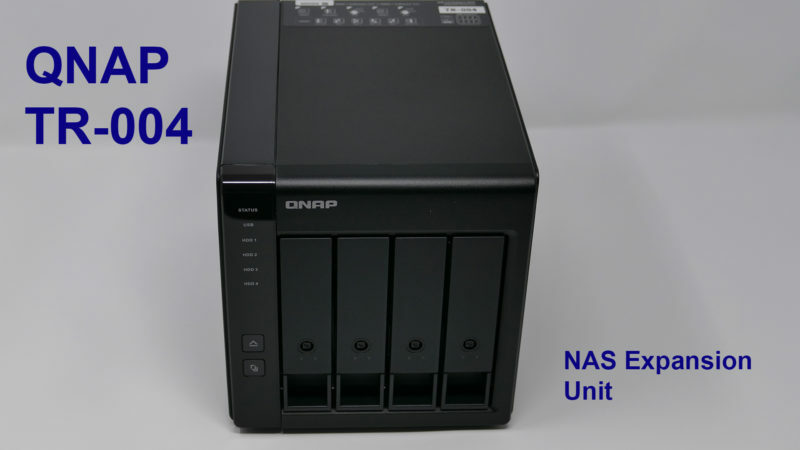 Presently I own 3 different QNAP NAS units and have been extremely happy with each one. As things turn out though, storage needs increase and it can be expensive to either add another NAS or to purchase one with more drives bays. Both QNAP and Synology have made expansion units for a long time however I was very intrigued when QNAP released this new low-cost TR-004 USB-C expansion unit. What caught my attention was that it could be configured by either software or hardware switches making it portable to either use on a computer or NAS unit as well as being directly supported by the QTS software for storage expansion. The thought of being able to move this around to different NAS units and computers was interesting as I was planning to use this expansion unit to hold my movie collection. Should something change in my network or a device get replaced, the ability to pop this onto another NAS or computer without copying everything over seemed like a great way to go and for a cost that is much less than adding a dedicated unit. As this is a new unit, the firmware/software needs a bit of refinement but overall it exceeded my expectations. No RAID migration like the NAS units at this time. No RAID expansion like the NAS units at this time. I have had this box setup and running with 4 x 6T WD Reds now for several weeks and I absolutely love it. Using the RED drives has quieted down the noise that I experienced during my initial testing and I have moved my entire MKV collection (about 9.5T) to it. Soon I will be rebuilding my Plex server and as this whole volume shows up as a shared folder on my QNAP, I can have it point to that share on my QNAP. The main issue I have with the box was the lack of RAID expansion. Another word as of this writing you have to configure the device with the number of drives you want to use right out of the box if you are going to use RAID 5. You cant change RAID type or increase RAID storage without reloading the data. You can, however, configure a 2 drive RAID 1 and then later add two more drives and create a second RAID 1 volume. I am sure that this will get resolved in a future firmware however right now you have to deal with this limitation. In my case, I was planning to fill the unit with 4 drives anyway however if you wanted to start with 3 drives in a RAID 5 configuration and later add the 4th one it would be an issue. Overall once QNAP polishes its software/firmware for this device and addresses these limitations, this unit will be even more powerful than it already is. Many people have a 2 bay NAS and would love to add more storage to and with this unit you can.